I never get tired of looking at this sweet little face. Neither to we! We giggle that we would like to live across the street from her just to admire her beauty! She is a beautiful girl - both inside and out. Seems like she has the sweetest personality as well! I love it when you post kittens but I love the Bean too. and like Laurie and the rest of her fans love looking at her pictures. She is once seriously cute lady! SO DO WE! Love the Bean, her glitter ball fetish, sneaking kitten fud and grooming of dirty boys. 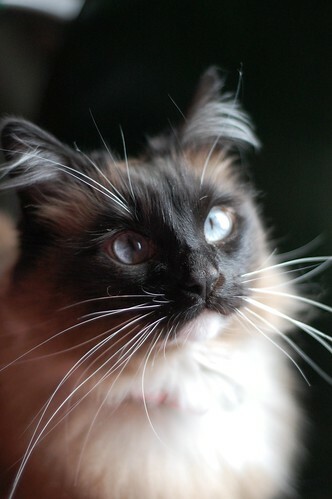 You certainly captures her inner beauty and lovely whiskers. Like Martin said, as much as it is nice when you have kitties, getting extra Bean posts is always welcome! She is a beautiful girl - both inside and out. I just love how she plays mom to all the babies. What a special cat to share her home and people with them. Who would? She is a shining example of cathood, beautiful inside and out. Yes, she is beautiful! But then, in my eyes, there's no such thing as an ugly cat! Lovely as always Ms Bean. Like you have a choice in the matter? What a cross-eyed little cutie! And it looks to me like she just said "what do you me, no kittens?? I WANT KITTENS (and kitten food...)"
She really is a beauty! As others have said, kitten posts are great, but Bean posts are wonderful too! Charlene seems like such a special cat. So do we! LOVE the Bean, and long may she wave! She really does have the most gorgeous little kitty face! :) She is one of the prettiest kitties out there. What a beautiful girl she is,,,picture perfect~! Makes me want to have a cat, which I can't have right now.. But I can wish MMMMM? Charlene seems to be one of those cats who just get more and more beautiful every day. My calico, Cookie, was the same way: kinda funny looking (but cute!) as a kitten, yet grew up to be a gorgeous floofy ladycat too. I luv Charlene Butterbean, she never ceases to make me smile. Nor do we! She is gorjuss! she is lovely ans this is such a perfect picture. Awwwww hi pretty girl! My hands are itching to gently rub that floofy neck of hers. Seriously, I could go one-for-one: one photography of Charlene followed by one of a kitten, followed by one more of Charlene, and so on and so forth. My words would most assuredly butter some parsnips, too. Ohhhhhh! What a beautiful picture of a beautiful Miss Bean!! A classic Hallmark card moment! I noticed people saying she has a lazy eye or cross-eyes. I don't see it. Maybe I'm the one with the problem? Her gorgeous whiskered face melts my heart every time! This picture is really beautifull. Looking at this picture for the umpteenth time I noticed that it looks like she's got one "eyebrow whisker" with a little crimp at the tip, on each side. So cute/beautiful! I hope I'm not a total lamer for pointing this out - while looking for something, anything new on the page :) I noticed that Georgie and Clarence aren't among the kitty photos in the "Kitties That Have Left Our Nest" section, but Imogene and Marcel are. What up?